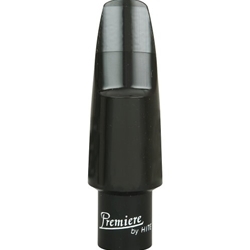 The efficiency of the facing design and the accuracy of the finishing make Premiere alto and tenor saxophone mouthpieces ideal all around mouthpieces. They are extremely versatile, capable of producing a variety of tonal colors for a variety of musical styles. Each model is produced with one preferred facing. Medium or medium hard reeds cut with a strong center and thinner sides (such as the Rico Jazz Select, LaVoz or Vandoren Java) work well with the overall mouthpiece and facing design.